Dramatic in floor-length navy, this unique desert floral print dress features a plunging neckline for a touch of opulent sophistication. With a relaxed fit and button-down front, it’s the perfect balance of style and comfort to elevate your look. Finished with side pockets for a handsfree night. 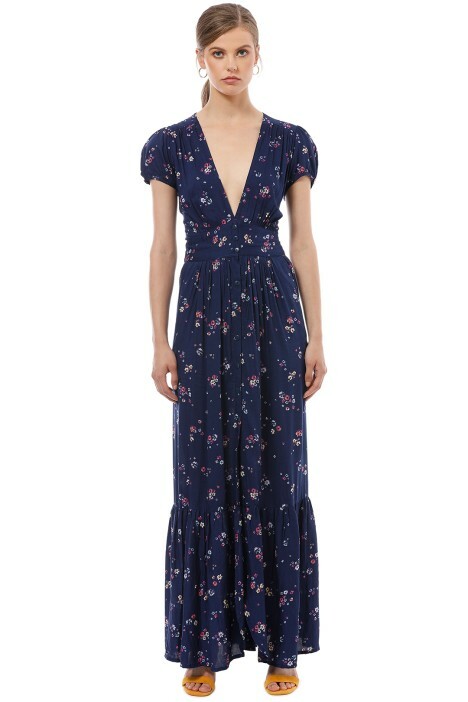 It's the perfect navy floral maxi to hire for your next tea party or summer wedding. Pair with an open toe heel and relaxed hair. Style with a pair of burgundy tassel earrings, and a navy pod clutch to carry the essentials! Check out our blog for more style inspiration on what to wear to tea time.